Simple to use, the iHealth Feel connected arm blood pressure monitor measures blood pressure, heart rate and detects arrhythmias. Self-monitoring of blood pressure has a real medical interest. It allows your physician to monitor your blood pressure and to adapt the treatment of your hypertension. More generally, blood pressure monitoring allows the user and his physician to anticipate cardiovascular risks. The free, intuitive and user-friendly iHealth MyVitals application (available for iOS and Android) offers a comprehensive monitoring platform and presents your vital data in colourful graphs and tables. It also allows you to manage your blood pressure according to the World Health Organisation and to share your results with your doctor. Measure your blood pressure with a clinically validated device, just like your doctor! 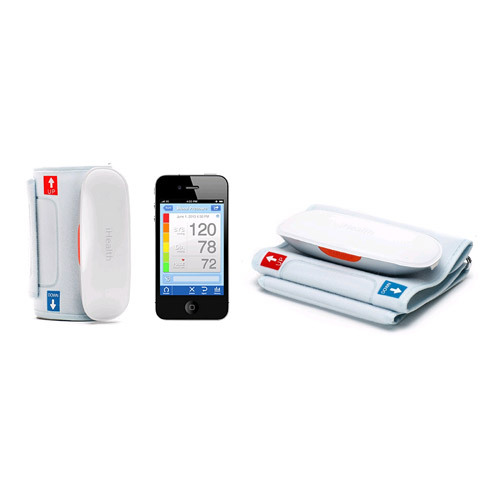 The universal 22-42cm iHealth blood pressure cuff fits all and is incredibly easy to use. Just put it on your arm following the arrows on the cuff and press the START/STOP button. The iHealth Feel is a Class IIa medical device. It is a regulated health product that carries, under this regulation, the CE marking.